Surely it’s a good omen to find out that one of your absolute favourite authors is doing an event only a short journey away from your new location the day after you move there, right? 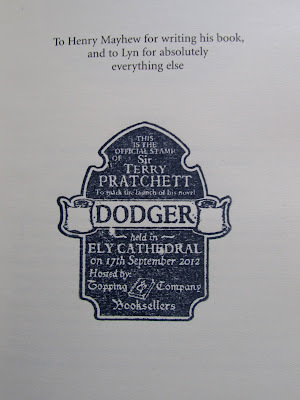 If so, luck must be on my side: I got the chance to see Sir Terry Pratchett at gorgeous Ely Cathedral in an event celebrating the release of Dodger. 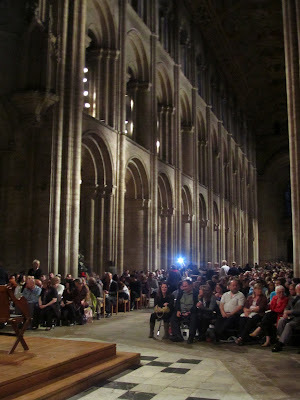 The place was completely full even though the cathedral’s capacity is over a thousand people, making this the biggest book event I’ve ever been to by far. Fortunately I managed to find a seat on the second row, so it felt like an intimate evening despite the size of the crowd. I have it on good authority that this pony is a Discworld fan. I’ll start with the one big “but” of an otherwise excellent event: there were logistic issues with the sound system that caused me to miss a good third of everything that was said all evening. And if this was true for me even though I was sitting up front, I can’t imagine what things must have been like for people at the back. Both Terry Pratchett and his assistant Rob were wearing small lapel microphones, and every time they turned their heads to the side where the microphone wasn’t, it became impossible to hear them. The event support staff did try to readjust the microphones a couple of times, but it was no good. 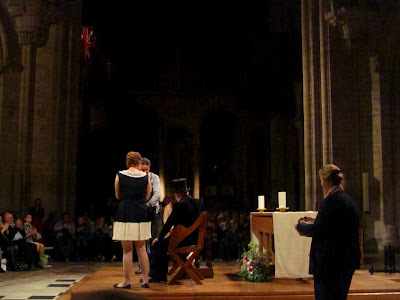 It was really a shame, because sound problems aside the cathedral was an absolutely perfect venue. The atmosphere was suited to Dodger’s Victorian Gothic feel and it was made even cooler by the bats flying overhead. 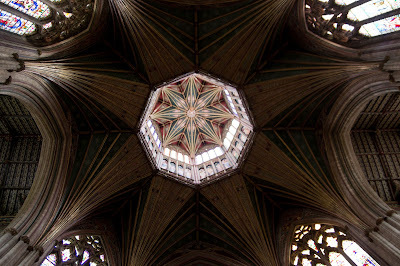 The ceiling of Ely Cathedral. No bats captured in the picture, unfortunately. Anyway, I won’t dwell on the sound issues for much longer, but I wanted to let you know that if this recap seems very abridged, the fact that I missed a lot of what was said will be the reason why. Terry Pratchett started by talking about why he chose to write a book set in Victorian London: he said he’d wanted to try his hand at historical fiction for a very long time, and this time period came naturally to him because of his personal history as a reader. He grew up reading back issues of “Punch” at the library and the magazine was a huge influence in his writing. Reading it was like getting a masterclass in how satire, humour, and literature work. Growing up with Punch also allowed him to absorb a Victorian voice from a young age, and it familiarised him with how 19th century writers talked and thought. He also mentioned Mayhew and Dickens as influences: as you might know if you’ve read the book or my review of it, the two are actually characters in the novel. Dodger himself is a Dickens protagonist – a very specific one, as readers of the novel will know, but Pratchett didn’t say more to avoid spoilers and I shall follow suit. Additionally, he said he was interested in one particular aspect of the Victorian age: the fact that inequalities were such that even in the richest, largest, most powerful cities there were people who wouldn’t be able to point out where they were in a map. The period was marked by huge scientific advances, but the majority of these didn’t spread beyond a very limited and elite sect of the population. That this kind of educational deprivation interests him is something you can clearly see in Dodger as a character: he’s smart and intellectually curious, but because of his class he never had access to what we now think of as basic information about the world. Part of what I enjoyed about Dodger was exactly seeing its young protagonist’s world become larger and larger as he absorbed all the facts that came his way. 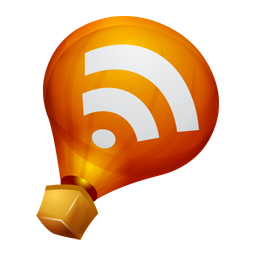 It was Dodger the character who was the driving force of the novel: Pratchett said that he came first and then pretty much found his own plot. He also said that a sequel is not out of the question, as he’s one of those characters that make him wonder what other interesting things they’d be up to after the end of the novel’s plot. The conversation then moved away from Dodger and towards Narrativia, the multimedia company Pratchett has just set up with his assistant Rob and daughter Rhianna (you can read a bit more about it here). Narrativia will be producing Discworld adaptations, and Pratchett’s goal in creating his own company is to be able to have a more hands-on approach. He told us about a proposed adaptation of The Wee Free Men that made him really uncomfortable due to the extent to which it was Disneyfied – especially in regards to Tiffany Aching herself, who was barely recognisable as the practical and self-sufficient heroine we know and love. Narrativia’s first project is based on the City Watch books: from what Pratchett said, it sounds like it might be a series set after Snuff telling original stories based around the characters we already know. Personally I find that a hundred times more exciting than an adaptation of one of his books. I can’t wait to find out more. What a beautiful setting for a fabulous event! I'm sorry your name wasn't drawn though. That cathedral is pretty awesomely atmospheric despite the large number of people. I am glad though that you go to sit in the second row; that definitely makes a difference. What an amazing event, Ana, and in such a beautiful setting too! I haven't read Dodger yet but I'm keeping it for a rainy day:) Hope you are settling in nicely! 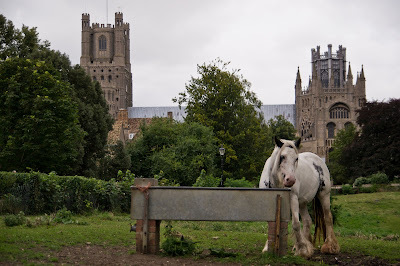 Oh, I know Ely Cathedral, I grew up in Norwich. What a wonderful venue for the event! Such a shame the acoustics were off, with a better microphone that would have been perfect. Let's hope they use it for other events in the future. This is very cool, but the fact that there were sound equipment issues is a little sad. I am glad that you had a good time though, and that you got a chance to see Pratchett. I also caught your little joke at the beginning about it being a "good omen". Very cool post today! So fantastic! What a great venue and I love his top hat! This sounds like a wonderful event, and a great book! I've sort of held off on Pratchett because my first foray into the Discworld books was a disappointment, but I've heard so many wonderful things about him since I began blogging that it's past time I put my reservations aside and gave him another go. This sounds like it could be a great place to start, so I've requested it from my library. Lovely write-up of this event! 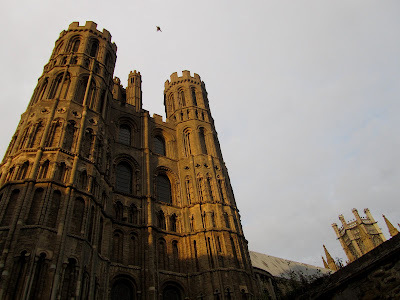 Ely Cathedral sounds like a beautiful setting, too, bats and all. Narrativia sounds like a very interesting endeavour and a good way to be more in control of adaptations (there are many many books out there that certainly should not be Disneyfied!). I LOVE those pictures, and I would definitely take is as a good omen to have my favorite author at an event in such a beautiful space when I just moved there! Are you excited to start over in a new place? Shame about the sound, but still sounds like a wonderful event. I would really love to go to something like this. I'd say that's a very good omen! Loved reading about how he came to write about Victorian London, because although jokes can be made of it, it's really not the sort of period you'd think you'd ever be able to associate him with. Exciting to hear about the company, so awesome that he'll be making adaptations himself. What an amazing venue. Not sure abou the idea of bats everywhere though! You know, I knew Dodger was out and have it on my list to get to eventually, but I really hadn't taken a lot of notice of what it was about so had no clue that it was supposed to be more historical fiction! Need to take a closer look I think. 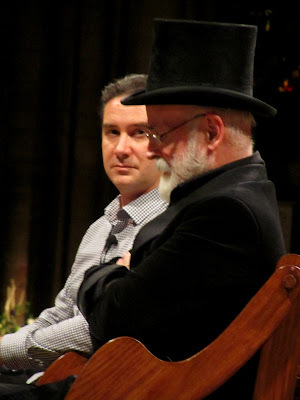 Oh, so jealous that you got to see Terry Pratchett--and in such a gorgeous place! And...films featuring the City Guard? Want want WANT! I was at that event, sitting waaaaay up the back but I had an anxiety attack and had to leave, 35 minutes into the talk. However I had the good fortune to pass Sir Terry standing on the High Street, talking to three teenage girls, who I'm guessing gave him the portable Banana Daquiri kit. I love the way he described Ely as a little island surrounded by a lot of dirt! What an amazing location, Ana! I am so envious of you :) And of that stamp! I've listened to his last three audio books (Snuff, The Long Earth and Dodger) and loved them all. Stephen Briggs is a great narrator. Despite the sound issues, this seems like an amazing place for an event! I've actually never read anything exclusively by Terry Pratchett, just Good Omens. Sounds like that's something I need to change! "Surely it’s a good omen to find out that one of your absolute favourite authors is doing an event only a short journey away from your new location the day after you move there, right?" Oh, I see what you did there, Ana. I am onto you. I adore the idea of event stamps, especially in cases like this. How fantastic! Kathy: It's okay! It would have been the cherry on top, but it was an awesome evening regardless. Trisha: Yes, it really goes. If I were all the way at the back I'd have felt like I was watching it on TV or something. Alex: Yes, fingers crossed! They used a big microphone for all the housekeeping announcements before and after the event and it made a world of difference. Meghan: Yep, slightly out of the way for you, I'd imagine :P Enjoy Dodger! Belle: Yes, exactly! I think some really interesting things are going to come out of it. Jessica: Fingers crossed that he does something near you one of these days! Charlie: To me the choice made sense because of the way he uses humour - it's always been there alongside darkness rather than instead of it. The balance in the City Watch books is pretty similar to the one in this book, so that should give you an idea of how he pulls it off! Marg: The ceiling was high and they were safely far away - wouldn't want them anywhere near me either :P And yes, I think Dodger is right up your alley! Cheryl: I know, right? :D I can't wait for more news on this project. Leonie: Oh no, I'm so sorry! Anxiety attacks are the worst. I've had them during classes and that was bad enough; I can't imagine having one ruin an author event :( But! That's so awesome that you passed him outside! The same happened to my boyfriend, who arrived a bit later than me. He called me saying he was standing near PTerry at the back of the Cathedral, but unfortunately I couldn't go back out again. Chinoiseries: That's lovely that you got to have that experience :D I'll always remember mine fondly too. He is one of those authors who I've yet to read and I know I'm missing out. Dodger sounds like a book I'd love. May have to start there and then go back in his catalog. Would you recommend starting with the Discworld series??? Thank you for this review. It was an awesome event in a beautiful location. I'm so glad I went, and this review has brought back the happiness and excitement of the evening! My group (we were the Teeny Tiny Tophat Brigade - one of us gave PTerry the mini top hat during the questioning) were sat reasonably close to the front, and got a decent view, but I had the same issue with the sound equipment and missing what was said. It's such a shame, but the evening was still lovely. Many thanks to the organisers too, for an otherwise fabulous evening!